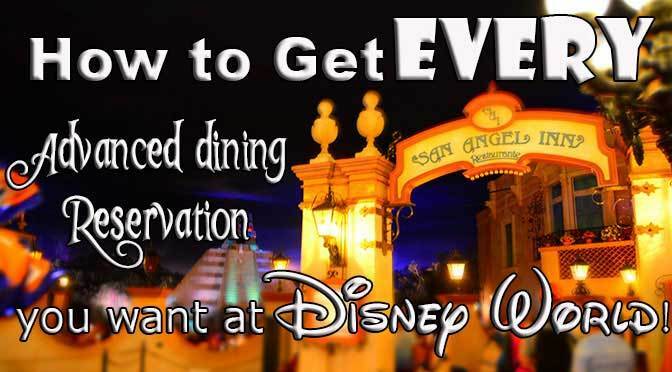 How to Get Every Advanced Dining Reservation ADR you want at Walt Disney World! When I share with my friends my strategy for making Advance Dining Reservations, they always look at me like I’m crazy. But inevitably when their own trips to Disney World come around they wind up lamenting to me about how when they called for reservations to Cinderella’s Castle or Hoop De Doo Review they were told that the restaurants were booked up. If you’re wondering to yourself “who is this person and why should I listen to her about making dining reservations at Walt Disney World?” I don’t blame you. But on our 2013 trip we were able to book not one, but two reservations for Be Our Guest Restaurant (which is still really hard to book), Cinderella’s Castle, California Grill (in the first week post-refurbishment), and many, many more. In 2013 we had over 25 Table Service ADRs for our trip, and in 2015 we had the same success, booking over 30, including Cinderella’s Castle for the week it opens after refurbishment! For those of you unfamiliar, ADRs are “Advanced Dining Reservations”. Disney World restaurants begin taking ADRs 180 days in advance. I wrote a bit about the different steps in trip planning earlier in my Trip Planning 101 post. The big disclaimer from that post that is worth repeating here is that I’m not saying this strategy is right for everyone— I’m definitely a type A over planner, and my level of obsessive pre-planning would probably drive some folks bananas. I know there are lots of families that like to be very flexible and un-scheduled on their vacations. I’m just not one of those people. I like to know what I’m doing, when I’m doing it, and ensure that everyone gets to do as much of their “wish list” as possible. Dining is a big part of our Disney experiences, I’m a big believer in family meal time and many of our favorite memories were made at a character or castle meal. Scheduled meals make a great break from the park, and an opportunity to relax in AC while still technically participating in the Disney experience (especially when we’re talking Character meals). I know that table-service restaurants aren’t as important to everyone, but if experiencing a particular venue is critical to you, I’ve got some tricks that might help you out. You need to make your trip itinerary in advance. I start this months in advance and have the “ideal” schedule buttoned up at least a week in advance of the ADR date. Be sure to look through the Disney World Menus to get an idea what you might eat. Our plan goes through several revisions as I get feedback from the rest of the family going on the trip. Together, we try to imagine how the days will go, and what risks there are (i.e., the nuts and bolts of getting from place-to-place, meals timed too far apart or too close, etc.). We research travel options between parks to make sure that our expectations are reasonable when making reservations for the same day at two different locations. Oh, by the way, here’s a little extra tip: Because you are able to make your ADRs ten days out from your check-in date, you have the greatest booking advantage on the days at the end of your trip. So, if it works into your plans, try to schedule the hardest to get meals/experiences for the end of your trip. Thanks so much for the helpful advice. We are going to Disney for 2 weeks over spring break and we’re staying at a Disney resort. I understand that I can make reservations 180 days out for the first ten days of our trip. what about dining reservations for the last four days of the trip (i.e., 180 +11, +12, +13)? Do I have to wait until it is 180 days out or can I reserve them on day 181+10, etc.? Hi Kenny! I am spending my honey moon in Disney World…December 23-27, and I would love some suggestions for dining reservations, packages, and anything you can think of to make this the most magical honeymoon ever!! I am a frequent Disney attendee but I am not always up on what are the best things to do regarding dining reservations and special activities. Thanks!!! You can list who is in your party and opt in to whether you take care of their bookings or not. Others can create their own account and link it to you and your group booking. This means you have the option to have sole control of the booking and reservations or to have others book and reserve for themselves or the group! Hope that makes sense! Thanks for the advice. I will definitely do them! I do have 1 question…if we are going February 5th to magic Kingdom and not staying on a Disney property what date would be the 1st day I can go online at 5:30 to book for Cinderella Castle. We are hoping for a dinner reservation for 6. This is awesome thanks for the tips…our trip this year will be my husband and 2 kids. One thing I am not to clear of is when you say that make sure everyone has an account login and password and practice doing reservations…are we all not on the same account? Does my husband have to have a separate login and password? Or are we all linked together?! What do you mean by your ADR window opens 10 days before your trip? I have been able to book most of my ADR’s up to 6 months in advance without a on site stay booking. I’ve tried to get BOG for dinner but that seems to be impossible. Any suggestions for March 13-18/17?? ADR window opens 180 days before your trip and includes up to 10 days of booking. Not 10 days before as you stated. I am getting ready for my advanced dinning reservation date. I have set up my account as you recommended, with a credit card attached and a wish list of all the restaurants that I want to book. I also set up an account for my husband, again with the credit card attached and a wish list. However, I could not link his account to our reservation. It said that it was already linked to my account. Is there a way to link both of our accounts to the reservation? Are you aware of any schedule or reservations issues with Hoop Dee Doo lately? We are going in February and it looks like nothing is available for any month on the website but if I look at today’s day or the current week there is availability. I wasn’t sure if it was a glitch in the Disney website / system or if it has become that popular. We called on Saturday after trying to book and they said that they weren’t taking reservations for it yet. Just keep trying over the next couple of weeks. What is the Events number (versus the Dining number)? Thanks. Thank you very much!! really good information, we were able to get all the ADRs we were looking for. Additionally, would like to add several websites have alerts, a few we wanted to get after were booked, put the alert in place and you get a txt or email alert when opens up. We are also using this for the inevitable Disney has not put out the December schedule yet. Great info! I made a huge rookie mistake and booked BOG for the incorrect day! :( I keep checking the MDE; would I have any better luck calling? Thanks so much! Monday is finally our date to book ADR!! I have read this post over and over and we have our spreadsheets ready to go. I do have a question… We have 3 separate rooms with 3 separate reservation numbers. Should I book everything together or as 3 separate dining reservations? Our total group equals 12 so I’m worried about the large number affecting our reservations but I’m also worries about doing it separately and not being able to get 3. Anyone??? We just finished our reservations as today was ADR day!! THANK YOU for the great tips! We were able to get all of our reservations except for Coral Reef. We even got our first selection for dates and times!! We have a party of 12 so some of our reservations are 6,6 and we even had to do Cinderellas Royal Table as 4, 4, 4 but we are ok with that and knew that going in. For those wondering “Is it really worth getting up early for?” ABSOLUTELY!! My sister in law and I both woke up early and were on FaceTime and were able to book Be Our Guest, Chef Mickey, Ohana, Hoop Dee Doo, HV Disney Junior, Crystal Palace, Tonys Town Square with Electrical Parade, Liberty Tree Tavern, Yak and Yeti, and Rain Forest Café all before 545 (we are central time zone). I also had computer and Ipad going at the same time! We then called at 6 for Cinderellas Royal Table and Coral Reef but no luck so far with Coral Reef. My biggest tip is have everything ORGANIZED. That way all you have to do is look at your list, pick date, time and party size, and GO! My husband teases me often that I shouldn’t have published this advice because it hinders our advantage in booking meals if everyone knows the secrets! I tell him not to worry because not many people take the tips seriously: they think it’s over kill and boy are they disappointed when they try calling at 10 or 11 on ADR morning or – shudder! – a few weeks later. Sounds like you will have a great trip!! Thank you for sharing your awesome plan. I have read your article many times and I’m taking notes. My 180 day mark is in a few days. I have been getting familiar with the process and practicing like you suggested. This morning I tried Be Our Guest at 6am and I didn’t have the option to click on the date; but, I look now and the option is there. Was this a glitch or do I need to call for this dining reservation? My next question is…. do they leave tables open for Cinderella’s Royal Table for 180 day reservations…I tried at 6:02am and there were no reservations for any times for a table of 2….or did they just book that quickly? HI! Any advice for booking for a party of 17? I am concerned about getting anything we want if I have to take the time to book multiple reservations to accommodate our group size. Any advice would be appreciated! Question, we are staying off-site (family of 14) for the majority of our trip. But our first night we’ve decided to stay at a Disney resort to take advantage of extra hours, booking fast passes, and resys for at least Day 1 of Magic Kingdom. But I wonder if it is 180 days out + 10 can I book reservations for the remainder of my trip at the 180 day mark using our first night at the Disney property? It is only for the length of your Disney resort reservation. So, for instance, on our recent trip we were switching hotels partway through. On the 180 mark we could only make reservation through the end of the first reservation, then we had to wait until the 180-day mark for the second reservation to make reservations for the second half of the trip. What does “MVP” mean? I’m at the 185 day mark and want breakfast at Cinderella castle. I thought maybe it meant to pre-load my credit card info which I can do the morning of as its grayed out right now. Is it easier to get a reservation for 2 rather than 4? I may convince hubby to stay at hotel if it’s easier to do it for 2. Sorry, I was using a sports metaphor there (MVP=most valuable player, or in this case your most desired reservations!) it does help to speed things up if you load up your credit card info ahead of time instead of trying to do it the day of. And you can definitely try for 4, and if you get no options try again for 2. I have heard from some folks that Cinderella’s Castle has been unavailable online lately and they’ve had to call up for that particular reservation. So if you aren’t able to make it online that morning definitely try by phone when the phone lines open up! I really enjoyed this article and read it several times while planning which ADRs we wanted…..we were able to snag Lunch w/an Imagineer, pre-park BOG bfast, O’hana during Wishes and Rose and Crown during Illuminations (along with several other great ADRs)! Any tips of ADR for a group of 12? I have read all of your tips and we are counting down until June 13 when we can start booking. Should we use the group line or regular line for the ones we cannot get online at 6am? How do multiple people make ADR’s if you are all under same confirmation number? My husband is trying to set up his own my Disney experience account but can’t link our confirmation number (with hotel and dining plan) to his account since it’s already linked to mine? My ADR day falls on Memorial day… I’m assuming I will still be able to make online reservations at 6am, but if there are any issues, will I still be able to call at 7am. For example, as far as I understand, Pirates & Pals can only be booked by calling, so will I have to wait until the following day to do this? in othe words, I can book November 6 on May 10 but i Have to wait until May 13 to book November 9 b/c i’m not a disney resort guest???? Gratuity is based on purchases, so no you won’t tip on 2 year old who shares. Anna and Elsa have the longest lines by far. Go to Merida next. This was such amazing advice! All your tips (spreadsheet with assigned reservation priorities, restaurants saved in wish list, and both of signed in to alternate reservations) worked for us and sure enough within 30 minutes my hubby and I had all 6 reservations we wanted and when we wanted them. We’re CST so it was 5a reservations for us and the only downfall is now I can’t fall back to sleep. Too excited. lol Thanks SO much! Is the booking date the same for things like Pirate’s League, or does that have to be 180 days from the day you’re doing it? I would try it during your length of stay. Currently it only says 180 days out though. Now, I just have to make that change, and line up Pirate’s League on day 6 of the trip, and hopefully a Pirates and Pals cruise for the first or last night. Do you know the phone number for the Events line vs. the Dining Line? Thanks so much! This was a very helpful article. Thank you so much. The only thing I am still confused about is how the +10 days are opened up for reservations. When I hit thee 180 day mark and log on to the site, will those additional day be opened up automatically or do I have to call for those additional reservations? I just want to say thank you so much for the awesome advice! I’m so glad I found this post via Pinterest a few weeks ago. I read it thoroughly, took notes, and followed your plan. This morning I was able to secure every ADR on my wish list (four character meals, including CRT, and also BOG! ), most of them at the exact times I was hoping for. I also got my daughter an appointment at BBB, by calling right at 7 (on two different phones). This is our first (and probably only) trip to WDW, so I am extremely thankful and excited to know we will be dining everywhere we had hoped for. Thank you for taking the time to share your wisdom with everyone. Hi Erin! For Cinderella’s Table there may be a few reasons why you need to call the dining line instead of booking through the system: if your package doesn’t include a meal plan then you have to call up in order to pre-pay. Also, it may be that the restaurant will be closed for refurbishment on those dates. Those are the two that come to mind, but there may be other reasons. Disney is always fine tuning its systems. It’s great that you tried ahead so that you’re prepared when the 180 window opens up and won’t be caught off guard! Since you can book online an hour earlier than the phone lines open up, I’d still try to book it but know that you’ll probably have to call in at 7am. The BBB is booked through the tour line. They can also help you with making dining reservations, that’s the way I usually prefer to go. It’s also my opinion that the tour line is easier to get into in the morning with shorter wait… but that’s just based on my anecdotal experiences. Dining at Mama Melrose is not automatically a Fantasmic package. You need to book that through the phone line as well. You can go ahead and book the Mama Melrose meal you want online at 6am, and then try to rebook as a fantasmic-linked meal at 7am via the phone line. That way you’ll know that you at least have your meal booked. One thing I learned about the Fantasmic dining is that the latest you can book for dinner is 4pm (which is too early for dinner for us). I learned that the hard way on a previous trip and it mucked up my days’ schedule having dinner at 4. Now we do the fantasmic-linked meal for lunch instead. Having the same problem with Cinderella royal table. I have the deluxe dining package, credit card on file. Trip planned for thanksgiving week. If you can not get a reservation, for example Be Our Guest, is that it for that resteraunt? This is our first trip to WDW. Going in April. Have you any experience trying to dine with an Imagineer? This is only reservation I’ve been unable to get for either our Jan or May trips. I started at day #180 and have checked the website and called multiple times since. 1. I see that I can book ADRs starting 180 days out. If my trip is for 7 days, can you book ALL the ADR’s 180 days out from the 1st day of your trip or do you need to login each day (say for 7 days) to get ADRs for each day of the trip? Hopefully, my question makes sense! Just wanted to say thank you for all your great tips. After 2 months of planning, my husband and I were online yesterday at 5:30am to book our ADR’s for May. He was on the Disney Experience app, and I was on the website. Per your suggestion we each had a list with our “dream schedule” along with a back up plan. Thank to all the prep and the ungodly hour, we were able to get all of our first choices except one. We WERE able to get Cinderella’s Castle for Breakfast, Be Our Guest for dinner, along with California Grill, and Akershus. The only thing we weren’t able to get was the Aloha Dinner Show, but decided to go with our second choice and were able to book the Fantasmic/Brown Derby dinner show package. We can’t wait til May for our trip, and we will definitely be following more of your great advice! Aloha Dinner show probably hasn’t listed yet, but honestly, I’d prefer any of the other dinner shows over that one. Glad we could help! I was able to somehow book two early morning breakfast spots (within 20 minutes of each other) under my disney account. I’m going with a large group so 4 of us will dine at crystal palace 8:05 and 4 at be our guest 8:20 I didn’t realize this wasn’t allowed because it let me. Im the lead reservation holder on both and I’m afraid 1.) disney won’t let us all in the gates Early when they see I have two reservations 2.) if they do there will be a problem when I’m personally not at the second reservations (do they require to show your Magic band?) thanks! Hi Kenny. My family of 4 is going to the MK this November and wanted to have breakfast at B.O.G… I was only able to book a 8:25 am for 2 guests, and two separate 8:40 reservations for 1 guest. All reservations are under my Disney account. Will this work out? Thank you so much for all of this awesome information! We are finally taking a trip to Disney World and our 2 girls are hoping for all things princess! I am also crazy about planning and have been researching all that I can in order to make this happen for them. 1) If our reservation is for 14 days, so when can I make the reservations for the last 4 last days? I saw that you said something about only being about to make reservations for +10 days at the 180 day mark. 2) Do I have to go through my vacation reservation somehow to make my dining reservations online to get the +10? It seems that right now the system will let me make dining reservations for 180 days in advance of today’s date (it is not locked like the Fast Pass feature). Is this how it always is and then at the 180 day mark of my vacation reservation it will show me 180 +10 instead of just 180, or am I going to the wrong place? Hi Melissa! Would it be possible for you to make a full list of dining reservations in order of difficulty? We are going to be eating at places I’ve never even heard of like Olivia’s and Beaches & Cream as well as Tusker House and 50’s Prime Time. We want to make 18 reservations total for our trip and I just don’t know which ones should be trier one, two, or three priority. Please help! That’s my whole list of #1s— these are essentially the restaurants that are impossible to get. Difficulty 2 – All the Character Meals such as Chef Mickey, Tusker House, Ohana, 1900 Park Fare, Hollywood and Vine, etc. I’d also lump “special meals” like the Dessert Parties, Mickey’s Backyard BBQ, the Perfectly Princess Tea Party, or the Villains Soirée in group 2. Difficulty 3 – Everything else. You might have a restaurant that someone in your group has their heart set on and that might move it up your priority list of course. I’ll give something a bump to 1 or 2 status if my day’s plan will fall apart without it. I think you could if you login using their account. You can make dining reservations for parties larger than the number of guests on your resort reservation. However I suggest you get ready to split the party in 2 or 3. I will meet some neighbors there and their check-in date is one day later than mine. I tried to get reservation for all of us (8 people) and didn’t get any luck, so I made reservations just for my family (3 people) and had no problem at all. The following day they made their reservations (they already knew my schedule) and got all but BOG dinner with time differences of no more than 15 minutes from mine. Then we will try so seat together. But at least we have our reservations done! Thanks for sharing that information, Claudia. I will soon be making my reservations for the week after Christmas and will try to follow your lead! I am booking for a party of 11, some of whom have a check in date one day earlier than mine. Because our reservations are linked in My Disney, I believe I should be able to make reservations for us 180 days from THEIR earlier check in date rather than waiting a day for my 180 day window to open. I don’t really want to wait for the critical moment to find out if this is true (I could ask my family members to let me log in as them instead). Has anyone tried something like this? I believe you can but you will need to make the reservations under the account that has the earlier check in date — hopefully you have access to their account login? Or are their reservations under your account? I make my reservations today for Christmas week 2015. I don’t know why, but I tried to complete the process at 5:32 am and got a message that “you can’t make a reservation at this time”. At 5:34 I tried again and got it! At 6:00 am I had already made 5 reservations (BOG lunch and dinner, California Grill, Chef Mickey’s and Le Cellier). So I really suggest that you try early, as it might work on that day! At 6:40 I had 16 reservations and just missed Liberty Tree Tarvern (which I found out later by phone that is not accepting reservations at this time due to refurbishment). And all reservations were in decent times (lunch between 12 and 1pm, dinner between 7 and 8 pm). Thanks! I logged into two devices and was able to make 2 reservations almost simultaneously without any issues! Hopefully I’m that lucky on my 180 day window!! Were you logged into the same Disney account on each device? I’m trying to plan my strategy. My window is approaching and I’m starting to panic!! Lol. Hello, great tips!! My 180 day window is fast approaching and I have a few ‘tricky’ adrs I’m wanting. I think I might try your multiple account tip. My question is, if we create an account for the other adult (my daughter) in my party, do we need to link our accounts together before we make the adrs? She is already listed on my account. My mom made some of the reservations under her name (she prefers to call) and I made some of the reservations under my name (online) and we didn’t have trouble checking in for meals regardless of whose name they were booked under. If you’re unsure, go ahead and have the other adult in your group set up their account and practice making ADRs for sometime in the next week to see how the system works (then cancel them right away of course). Oh, speaking of tips! Remember that for groups over 6 there is a mandatory 18% gratuity! We had a group of 9 on the deluxe dining plan and were pretty shocked by what some of the tips added up to (all those ‘free’ $9 desserts!) Don’t forget to budget the tips in! Just wanted to say I was able to book 8 ADR this am using two computers and an iPad side by side. Preloaded different tabs on each one with the place, time, date and party size and got all 8 booked in under 10 minutes! Great article! I’m so glad the advice helped! I was pretty excited when I realized I didn’t have to wake my husband up at 6am to make ADRs with me, but could just steal his laptop! I sounds like you have an awesome trip planned, all my favorite restaurants! Thank you so much for all of your tips! We are staying for three days in October and followed all of your advice. I am happy to report that we were able to secure tables for 10 at Ohana, Chef Mickey’s, Be Our Guest, and Whispering Canyon Cafe all on our first choice days for the meals we wanted. If I am booking my trip with a travel agent can I still link it with the disney website to make ADRs? Yes, and your agent can assist you as well. Use my recommended agent for awesome service. Our trip will be 9/20-9/29. I have AK (and TH) scheduled on one of your “green” days Kenny (9/24). I went back and looked at other dates and snagged an 8am TH ADR for 9/26, which is also a day you have as “green,” Kenny. Think we should delay our AK day until then? If I did switch up our itinerary to accomodate the 9/26 ADR, I’m not sure what park we would go to that Thursday. With no MNSSHP, I would expect MK to be busy, the F&W Festival opening at EP I would expect the same, and we will be at HS the day before on 9/23. Maybe make it a water park day? I hate putting AK that late in the trip because I know pretty much everyone else in my family will be itching to get there. What do you think about an abbreviated touring plan/late arrival to AK (you have one, right?) on Thursday, then an early arrival (with the ADR) on Saturday? If we did that we still should be able to make a 7:30 ADR at CRT on that Thursday, I’m thinking? I’ll have a lot more plans before your trip that will be available on http://www.characterlocator.com A water park day sounds fun. If you do MK that day, be sure to arrive before park opening and follow a plan and you’ll still have a nice day. Depends upon what date you are visiting. You would likely be better off getting FP for Safari or coming back late in the day. You can reduce the number of guests, just can’t do a no show without penalty. Our 180 days out comes this Tuesday. How would you prioritize an 8:00am Tusker House reservation to come in the middle of a 9-day trip? I definitely have CRT dinner and BOG breakfast at the top of my list, and from looking at (okay, constantly stalking) current availability, it appears Chef Mickey’s has been having more open tables than ‘Ohana, so I will probably go for the latter of the two first (both dinners). I’m less concerned about my other ADRs (Akershus, 50s Primetime, Crystal Palace, and California Grill–it seems like a two-top isn’t as hard to come by in this location; the rest of our ADRs will be for 4-6 people.) based on the most recent trends I’ve observed. I guess my question is, do I prioritize the 8am Tusker House breakfast before or after the ‘Ohana and Chef Mickey’s ADRs? The 8am time is basically the only time I am not really willing to be flexible with. At 5:55am I had no trouble getting CRT, BOG and the other dozen ADRs we were after but I did have 2 computers going simultaneously so that’s my best advice to you! On the preload your MVP and hit submit at 6am, how can you even select the date before 6am? Also, in above comment, you said you made 2 reservations at BOG for your large group and asked to be seated together. Was this under two different accounts? Or did you book one hour apart, under the one MDE and show up early for one of them? Lastly, I noticed the “heart” icons on the MDE and selected several of them as my favorites. I can’t figure out how to only view my favorites, or wish list, on MDE… Can you help? 1. You can select the restaurant, date, and time but when you hit submit prior to 6 it gives you a “can not make reservation for this date” error. Essentially you are profiling the form and not hitting submit… It always let me select the date, but would return the error when I hit submit. 2. When we made our 2013 BOG reservations, the system was flinching and I couldn’t use the online reservation system. Those 2 reservations were made over the phone with a customer service rep who was able to override the system. Even then I think they were still 10 minutes apart, but under the sane reservation #. My recommendation now would be to make the first one at 6am online and then make the 2nd one via phone when the phone lines open— at least that way you know you have a table for SOME of your group. They also might have revamped the system by now to accommodate large groups at BOG, on the upcoming trip there’s only 5 of us so it wasn’t an issue. 3. To view just the restaurants you’ve favorited you go to the top right under your account and choose “my wish list” from the drop down list, this will bring up a list of everything you’ve favorited in alphabetical order. For the purpose of using this feature as an ADR day shortcut I don’t favorite anything except restaurants until after ADR day, and only the restaurants I plan to book, in order to keep the list small. You can also just use the search function to pull up each restaurant if you are a fast typer, but this adds a step and an extra page load to the process; depending on how snappy the response time is on this site in the AM that extra page load for search results can get very frustrating. Hope that this answered your questions? Good luck with your reservations! Obviously you’ve done this, and it works, hence the post… I have been told that you have to log out of your account and right back in at 6 am for your entire trip dates to appear. I guess this is not the case? If you hit submit at 6, your trip dates will be there and ready to roll? Hi Heather! I have never had to log out and then log back in, unless the system hiccups. BUT, I am using the site on a Macbook using Safari, it could certainly be different on a PC or in a different browser. That’s why it’s crucial to get in ahead of time and practice making ADRS, which you are doing. I think you’ll have great success! Keeping my fingers crossed that you get everything on your wishlist; booking long trips for big groups is a unique challenge! (Our last trip was 9 people (three families), for 9 days). I now realize that you are the woman who made those INCREDIBLE MASKS for Kenny’s little girl for the Halloween party and Soiree? They were incredible! I love them and you are very talented! What a ninja you are! I employed many of these strategies and was also able to score the ADR’s and tours we were looking for our next Spring Break vacation. I have one tip to add. Do not be discouraged by the website giving you an tech error message…particularly that the “search function” is not working. Ignore it, scroll down and click through. I learned by accident about the dual reservation abilities of the CM’s on the TOUR line. I called to book a tour and after we were done, the CM asked if I needed any dining reservations? Oh? Well actually, I wanted a later Mama Melrose F! time than I just booked that morning and yes, they could help with that! Another piece of advice I give friends is book everything you think you might want…you can cancel later. And don;t give up if you miss something! Disney’s new credit card policy’s make the chances of picking up a hard to get ADR much more likely. I love your tip about favoriting! I had done that and I think it helped. One big thing that I just realized I forgot to specifically call out is that you need to link your disney.com account to your hotel reservation by entering your reservation # in, in advance of ADR day. I should probably figure out how to edit so I can make that clearer. What does that last part mean about linking your hotel? We booked 2 Poly rooms and DP at the same time (package), and both Poly reservations and all 8 people show up on my MDE. I’m good to go, right? If your reservations are already loaded into your Disney.com account then you’re all set, Heather! Ours haven’t been auto-loaded so we’ve had to manually add them. Hi! I have a question about ADR.. I forgot about my 180-days mark to go make a reservation at be our guest but I still haven’t given up! Is there any difference between calling and checking the website? Because I keep refreshing the website page multiple times a day but as I don’t live in the US, never tried to call. Thank you very much! I love this blog, most of my vacation plans were made based on your tips! I do not believe there is any difference between the online availability and the web. There’ve been a few times when I’ve called to verify what I was seeing on the website was true, I’ve been told by customer service (a bit exasperatedly) at the Dining line that the info they see is the same as what’s on the website, and if there is no availability on the website then there is no availability, period. I still call occasionally, I can’t help it. Cancellations DO happen the day before because folks want to avoid the $10 fee, so be sure to call at the 48hr, 24hr, and the day of, even if you are already in the parks. I found standing in line to be a great time to call (or use the mobile app) to check availability. When we were on our 2011 trip (which we booked at 8 weeks out), this is how we were able to book most of the ADRs we got (though they were at really weird times). You might also try some of the Disney boards, I occasionally see folks with “extra” reservations offering to transfer them to someone else’s name… though I don’t think that that’s technically allowed and I’m not sure how they do it. Belle’s castle is an especially tricky one. Best of luck to you! And remember if you can’t get a dinner ADR you might still be able to get a FP+ for lunchtime. Same great atmosphere! Thanks for sharing your plan. It’s great if you’re fortunate enough to be staying longer than 7 days, able to book before or at 180 days (190+), and not going during free dining. Free dining is crazy and really tough if you have a large group. We’re staying longer than 7 but were held up by family who weren’t sure of their booking dates. Next time, I will book everything including dining over their dates and then make changes after they book if I need to. Stalking the Disney dining search tool, calling daily for BBB, and some new friends at DIS have helped us to get our plans together. For a new visitor it’s really overwhelming. Hope your plan helps someone. And by the way, it’s Akershus. I hear you about large groups! Our trip in 2013 was for 9 people (3 separate families) and scheduling dining was a monster chore. It’s hard to get tables for that many in the first place, and in the case of Be Our Guest we had to book two separate reservations for 5 and ask to be seated together when we arrived because they simply didn’t book for that size group. I can’t imagine trying to organize a trip for that many people without the advantage of the advance booking window, it must have been really hard! It’s definitely great advice to just go ahead and book something for everyone so you have a fall-back plan, and then let the other relatives opt-out if they change their mind. You might try the approach of booking two smaller reservations for the same time and then asking upon check-in to be seated together, that worked for us at several venues! In 2011 we met up with our cousins (we were the hold up group) and at 8 weeks out were unable to schedule even one meal together despite daily stalking— they already had their dining in place following the 180-day rule, and we were able to cobble together some ADRs for ourselves, but it was a bummer that we couldn’t be all together, which is what led me to evolve this admittedly crazy process. I probably won’t ever plan a “short notice” trip again because of that experience. With regard to free dining, did you know that if you book your trip way out ahead, when/if the free dining promotion comes out Disney will let you apply it to your trip even if your trip is already booked? I’ve never done this myself, but I have friends who insist on booking this way so they can take advantage of both the ADR window and the free dining. You don’t have to pay the balance of your package until a few weeks before check-in if I recall correctly, so so long as the free dining promotion comes out before you pay in full, you don’t have to mess with having overpaid. Something to consider for your next trip (though – caveat – you’ll want to confirm with the booking agent that that’s still the policy).